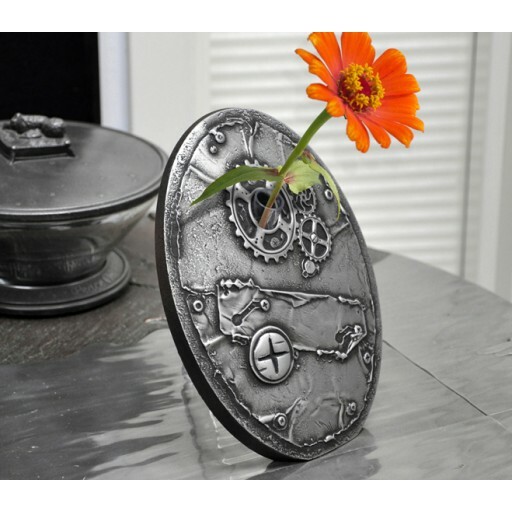 The timeworn steel ornamentation of this flower vase from designer Roger Questel’s Boiler Room Collection creates a perfect industrial backdrop for the single flower. This steel flower vase includes an acrylic test tube, which holds a flower and water, while also forming the stand. Flower vase, clear plastic test tube, and black rubber o-ring. Simply slide the test tube through front opening until it is firm, then slide O-ring up the back of the test tube to secure the position of the tube.